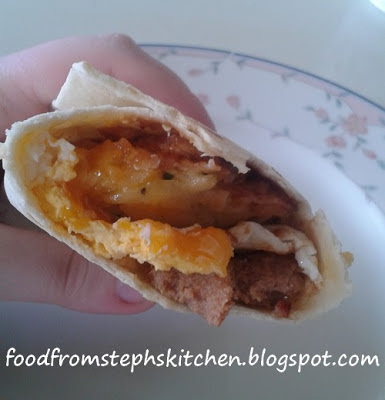 Breakfast wrap with egg, bacon, sausage, hash browns and cheese. I love breakfast wraps. If I'm on the run and need breakfast I will always try to get one. The ones I love the most are with bacon, egg, hash browns and cheese - and if they also have sausage it's an added bonus. I haven't been able to have these at home before because hash browns are not something I keep at home. But yesterday that was all I wanted, so I threw together some hash browns (which were super easy to make) and it was so worth it! The best part was I'd made tortillas with chilli mince the day before, so I had left over tortillas for these. Cook up your hash browns, bacon, sausages and eggs. Place your wrap on a cutting board or plate and start layering your wrap, adding the relish or sauce last. You want to layer your wrap in the middle of the top two-thirds of the wrap. Hopefully that makes sense! Fold your wrap by folding the bottom of the wrap up, then the sides. Put the wrap in a hot sandwich press until golden brown and your cheese has melted.